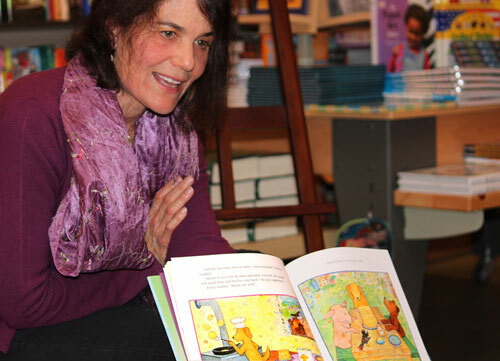 By Allison R. and Paloma P.
Bay Area author Elisa Kleven has written 15 children’s books, including The Paper Princess and Sun Bread, and illustrated 17 other books, like Arthur Dorros’ Abuela. Author Elisa Kleven reads one of her books. Photo by Kathleen Gulley. Q. How many times has your family inspired your books? A. I get many ideas from my family and my children, and from my own childhood as well. I got the idea for Hooray, a Piñata! when my daughter picked out the cutest dog piñata, made friends with it, pretended it was a real dog, and then was heartbroken at the prospect of breaking it at her birthday party. We had to buy her a less cute piñata to break instead! The Paper Princess was inspired by my memories of making paper people in my backyard as a child. Sometimes my tiny paper characters would blow away and I would hope they were having a good life out there in the big world! Q. What is the most exciting award you have ever won? A. I think the most exciting award was my New York Times Best Illustrated Book of the Year award for Sun Bread. Thousands of children’s books are published each year, so I was very honored to be among the ten best chosen by the New York Times. Q. What is your best childhood memory? A. My best memories, other than being on vacations in beautiful places with my three siblings and parents, were of playing in my wonderful, spacious closet, where I’d created a doll house. I would spend many happy hours making the miniature characters and building tiny settings and stories around them. This was great preparation for my grown-up work as a picture book creator, as I’m still creating little characters and worlds inside my books. Q. What is your favorite book you’ve written and illustrated? A. That’s a hard question to answer. I like my books in different ways, just as a mom appreciates the unique traits in her different children. But I suppose my favorites are The Lion and the Little Red Bird, and The Paper Princess. The Lion and the Little Red Bird is about color, friendship, art, music, and animals, some of my very favorite things! The Paper Princess has a fairy tale quality that touches me emotionally. Q. Have you ever actually made Sun Bread? A. I have indeed made Sun Breads, as well as moon breads and people breads. I love making edible art, and baking. Sun Bread was written during a cold, rainy winter, when I made a real bread shaped like the sun to cheer up my kids, who were sick of staying indoors. Q. What is something about you that would surprise people? A. I never went to art school – my art grows right out of my childhood way of playing and making small characters and scenes. And I have a condition called “synesthesia,” which means that I see colors with numbers and letters. For instance, in my mind the letter G is deep blue, and the number 5 is a bright, brassy golden. A. Shakespeare. I love the brilliant way he put words together! Another favorite is E.B. White. Charlotte’s Web is the best children’s book I’ve ever read. Q. What book would you recommend to a first-time reader of your books? A. I suppose it depends on the child. Puddle Pail seems to appeal to both girls and boys, and kids of any age. I think children can easily relate to the search for the perfect collection [like Ernst the crocodile, the book’s main character]. Q. What would you say to the kids at Montclair Elementary School? A. Don’t ever feel as if you have to leave your imaginations behind when you grow up! And feed your imaginations by reading good books, enjoying art, creating, and dreaming!